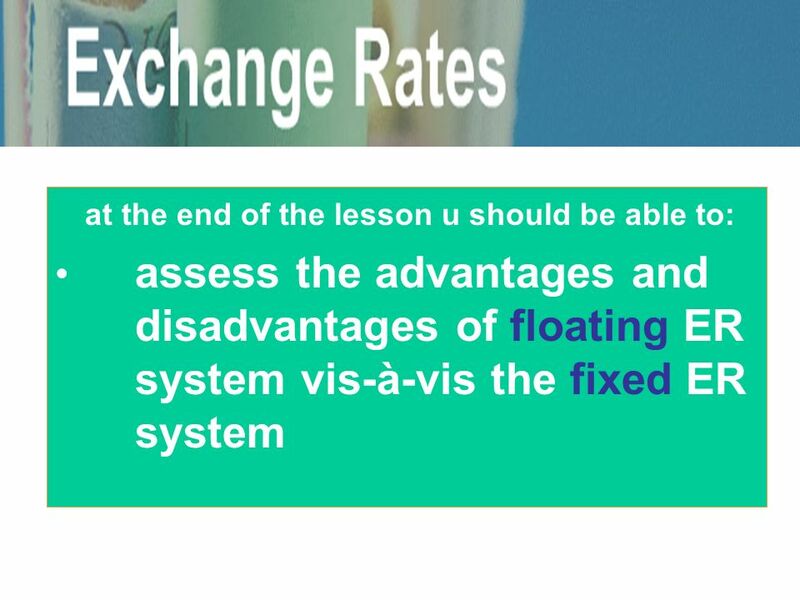 At the end of the lesson u should be able to: assess the advantages and disadvantages of floating ER system vis-à-vis the fixed ER system. 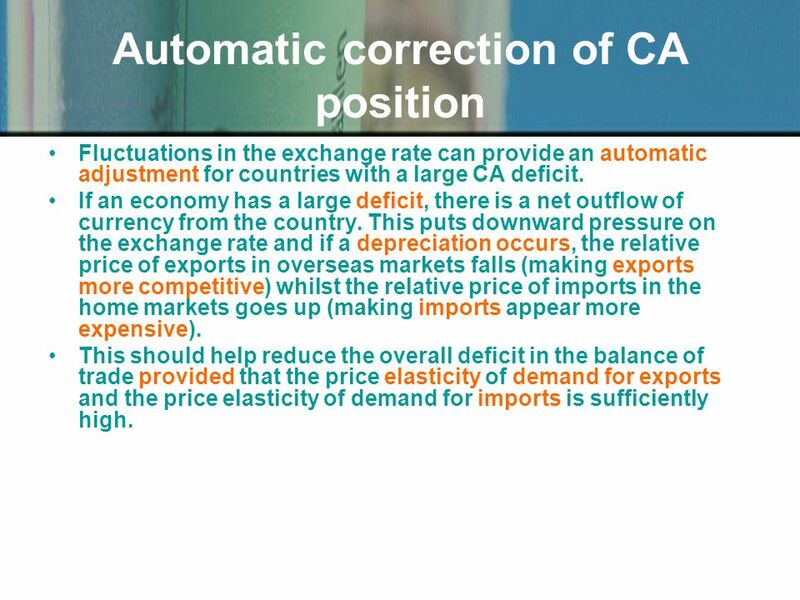 3 Automatic correction of CA position Fluctuations in the exchange rate can provide an automatic adjustment for countries with a large CA deficit. If an economy has a large deficit, there is a net outflow of currency from the country. 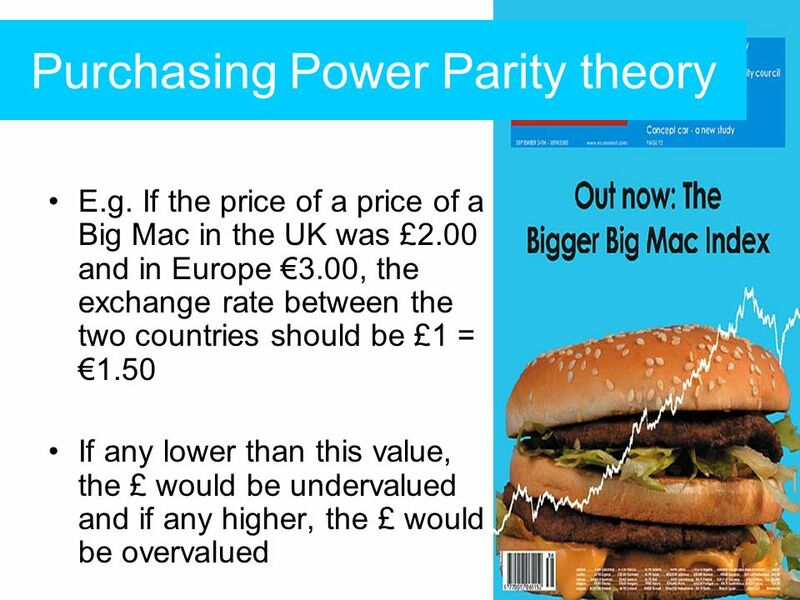 This puts downward pressure on the exchange rate and if a depreciation occurs, the relative price of exports in overseas markets falls (making exports more competitive) whilst the relative price of imports in the home markets goes up (making imports appear more expensive). This should help reduce the overall deficit in the balance of trade provided that the price elasticity of demand for exports and the price elasticity of demand for imports is sufficiently high. 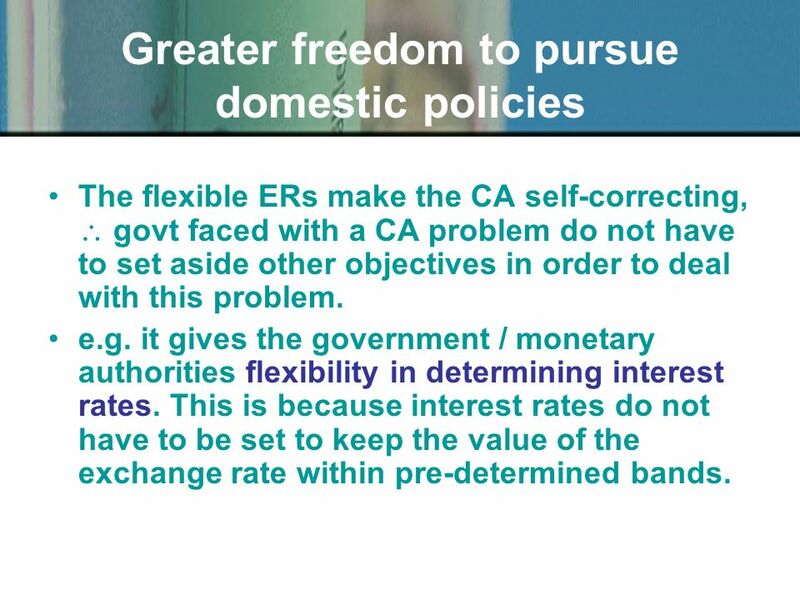 4 Greater freedom to pursue domestic policies The flexible ERs make the CA self-correcting, govt faced with a CA problem do not have to set aside other objectives in order to deal with this problem. e.g. it gives the government / monetary authorities flexibility in determining interest rates. This is because interest rates do not have to be set to keep the value of the exchange rate within pre-determined bands. 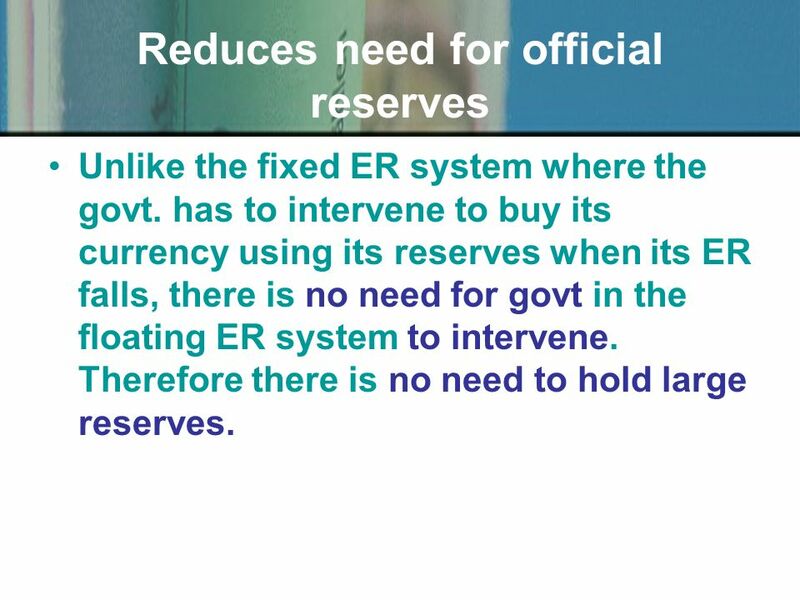 5 Reduces need for official reserves Unlike the fixed ER system where the govt. has to intervene to buy its currency using its reserves when its ER falls, there is no need for govt in the floating ER system to intervene. Therefore there is no need to hold large reserves. 6 Protection from inflation abroad With fixed ER system, inflation abroad can be transmitted directly into the country in the form of higher import prices. e.g. 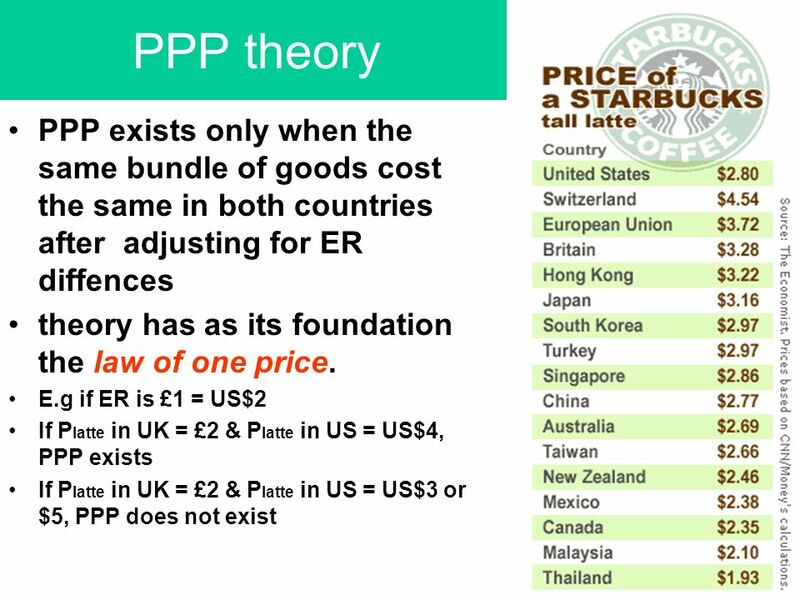 If the ER between £ and $ is fixed at £1 = $2, an American product, priced at $200 will be sold in UK for £100. If the price of M increases to $300, UK must now pay £150. 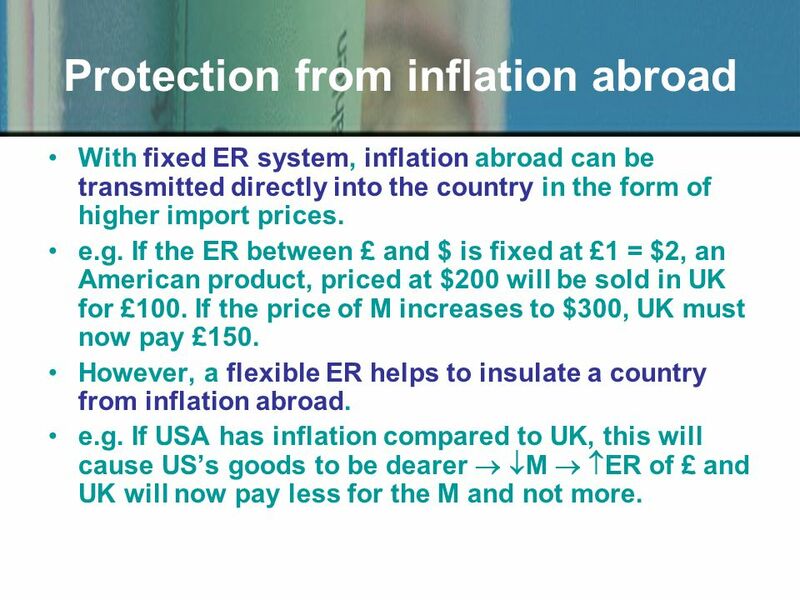 However, a flexible ER helps to insulate a country from inflation abroad. e.g. If USA has inflation compared to UK, this will cause USs goods to be dearer M ER of £ and UK will now pay less for the M and not more. 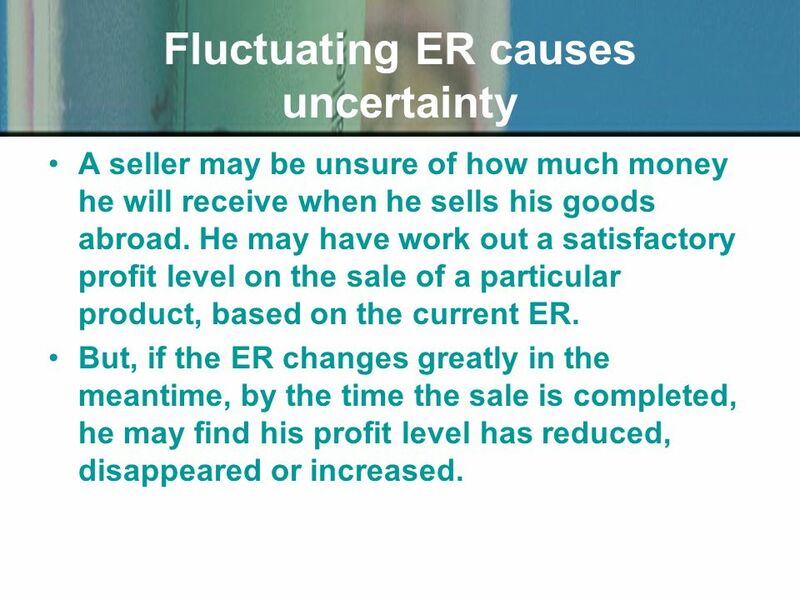 8 Fluctuating ER causes uncertainty A seller may be unsure of how much money he will receive when he sells his goods abroad. He may have work out a satisfactory profit level on the sale of a particular product, based on the current ER. But, if the ER changes greatly in the meantime, by the time the sale is completed, he may find his profit level has reduced, disappeared or increased. 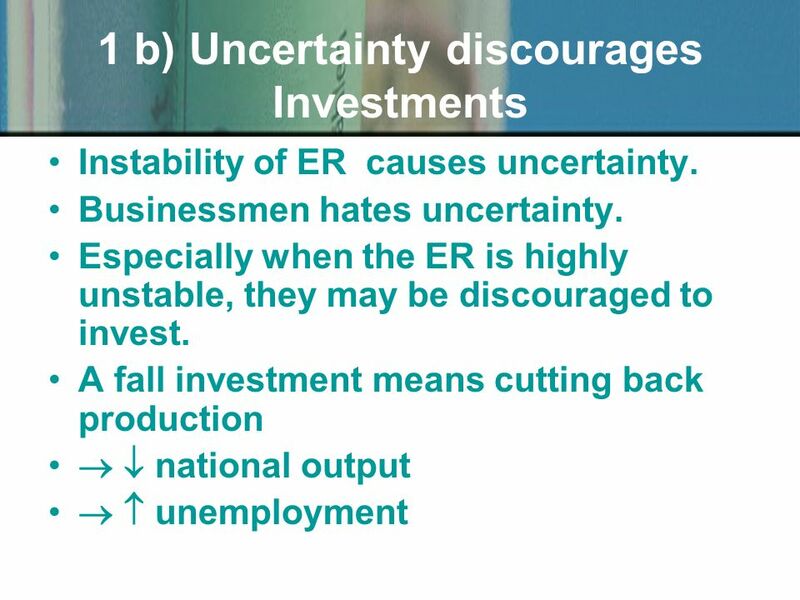 11 Encourages destabilizing speculation The day-to-day changes in ER may encourage speculative movements of 'hot money' from country to country, thus making changes in ER greater. For e.g. 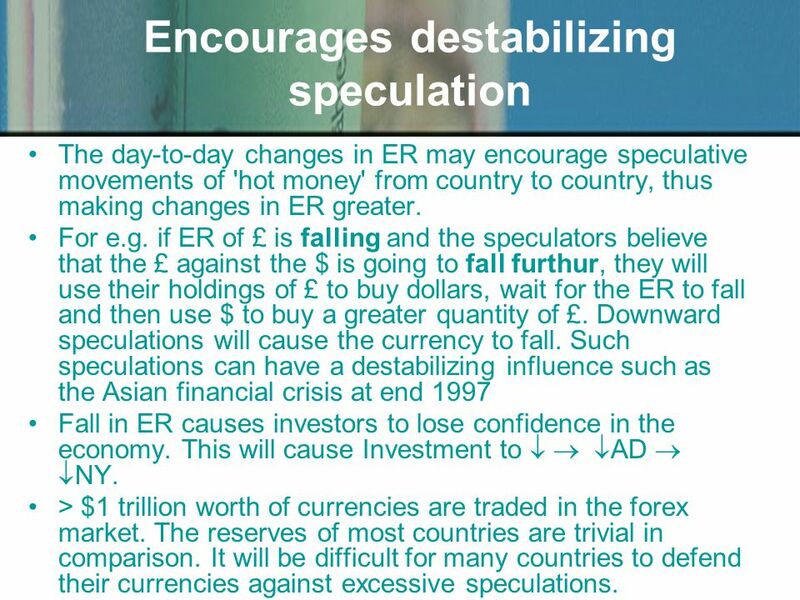 if ER of £ is falling and the speculators believe that the £ against the $ is going to fall furthur, they will use their holdings of £ to buy dollars, wait for the ER to fall and then use $ to buy a greater quantity of £. Downward speculations will cause the currency to fall. Such speculations can have a destabilizing influence such as the Asian financial crisis at end 1997 Fall in ER causes investors to lose confidence in the economy. This will cause Investment to AD NY. > $1 trillion worth of currencies are traded in the forex market. The reserves of most countries are trivial in comparison. It will be difficult for many countries to defend their currencies against excessive speculations. 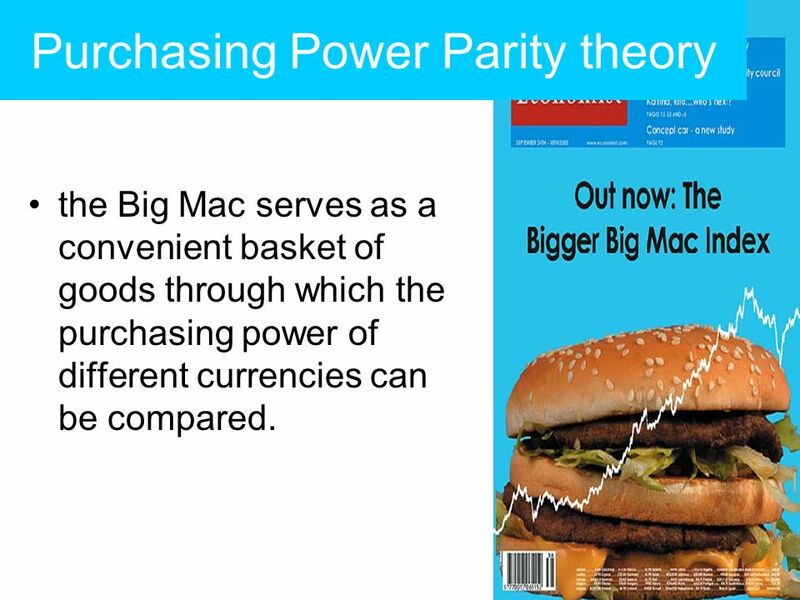 16 Purchasing Power Parity theory the Big Mac serves as a convenient basket of goods through which the purchasing power of different currencies can be compared. Download ppt "At the end of the lesson u should be able to: assess the advantages and disadvantages of floating ER system vis-à-vis the fixed ER system." 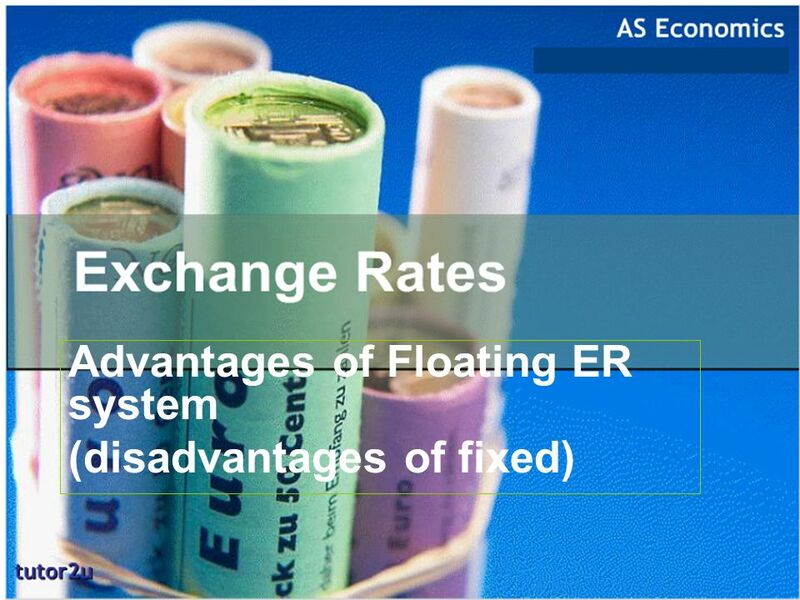 Objectives Explain how ER is determined in floating ER system. Reasons causing fall in ER – depreciation Reasons causing rise in ER - appreciation. 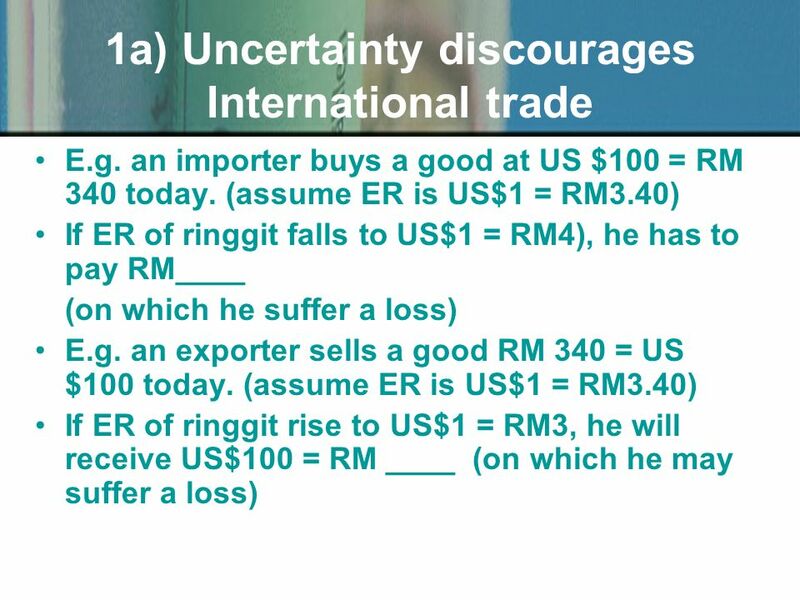 Unit: International Trade Topic: Balance of Payments and the Foreign Exchange Market. 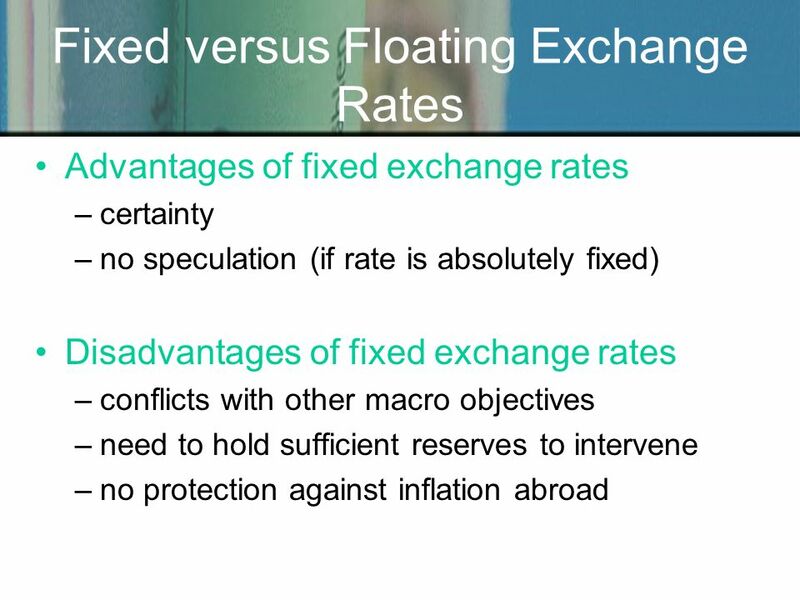 Session 8 Exchange Rates Disclaimer: The views expressed are those of the presenters and do not necessarily reflect those of the Federal Reserve Bank of. INTERNATIONAL ECONOMICS. Chapter 12: International Monetary System. Macroeconomic Policies Dr. George Norton Agricultural and Applied Economics Virginia Tech Copyright 2009 AAEC 3204. Copyright 2006 – Biz/ed International Economics Trade, The Balance of Payments and Exchange Rates. Ch. 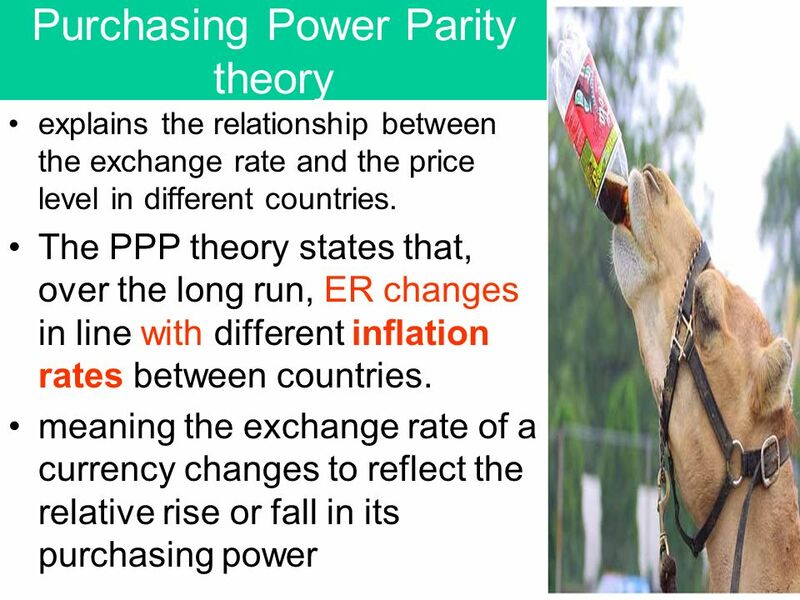 10: The Exchange Rate and the Balance of Payments. Exchange rates Currencies are bought and sold in the foreign exchange market. The price at which one currency exchanges for another in the foreign exchange. Copyright © 2001 by The McGraw-Hill Companies, Inc. All rights reserved. 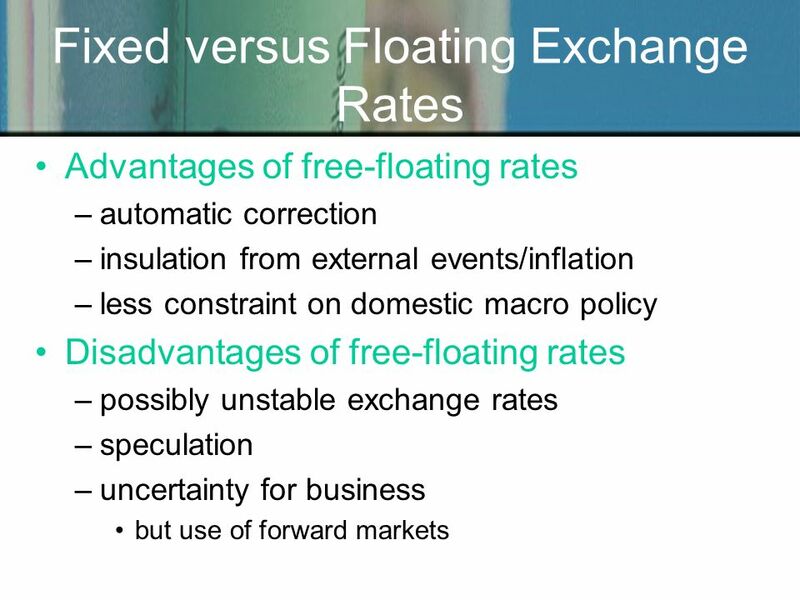 Slide Exchange Rates and the Open Economy. 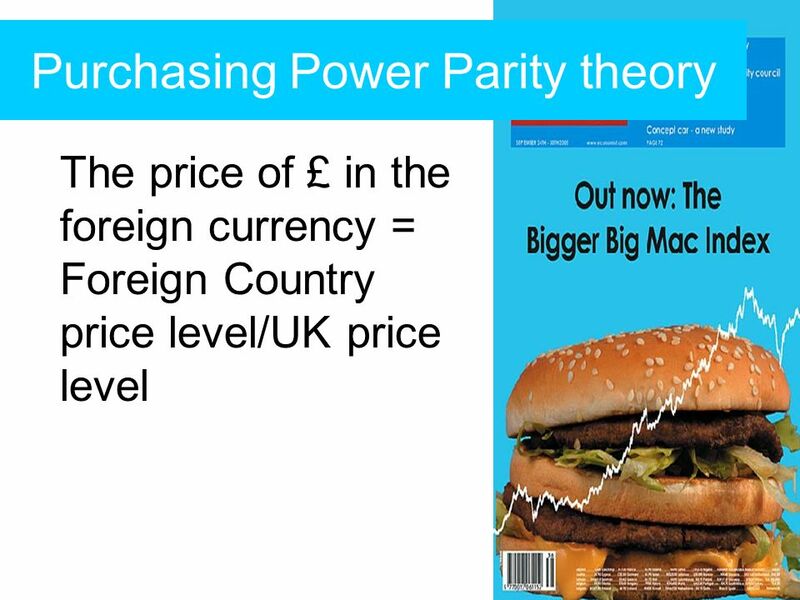 Lecture 15 – Foreign Exchange Market Factors influencing exchange rates. Exchange Rates and the Open Economy Chapter 18. Foreign Exchange Market Abbreviation: FOREX Over a trillion dollars worth are traded daily. Most trading. International Trade. Balance of Payments The Balance of Payments is a record of a country’s transactions with the rest of the world. The B of P consists.